We have a small update outside of our usual schedule for you! Things are more or less fixed now. CrossCode 1.0 will be released in September 2018!! We’ll have a bigger announcement with the exact release date around the beginning of August with all the bling and shing, but September is locked-in for sure! We will once again attend Gamescom in Cologne, Germany! We won’t have a booth, but will be strolling around as visitors on Tuesday (Business day) and Wednesday! If you want to meetup and maybe get a CrossCode sticker, let us know, best via Twitter (DMs are open) or in our Discord Server. Finally: Thanks to your publisher Deck13 we have a little Loyalty Discount for To Hell with Hell! 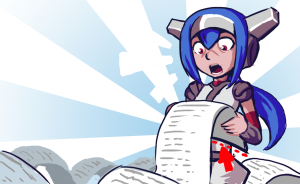 This means that any owner of CrossCode on Steam will receive a 10% discount (in addition to the current 20% discount) for To Hell with Hell! Just in case anyone is interesting in helping out Natasia down there… in hell. It’s a classic Bullet Hell rogue-like crawler with juicy pixelart still in Early Access! And that’s all for now! More details in August! Endlich. Freue mich schon auf den Release! Congrats on getting 1.0 (near) ironed out! Pre-emptive congrats on release as well! Finally! I can’t wait to finally play again this game once it’s finished. It’s been really nice helping you guys finding glitches and bugs, but we’ll finally play the finished product and i’m so hyped about it. Great news (and a bit of “finally!”), I can’t wait to play it. I hope we see a final dungeon in the Japanese style area that leads to the final boss. While we don’t get a new ability or something it could still be one of the “big dungeons” of the game with a master key to find. So glad to see that this game is finally about to reach completion. My money is ready! hooray! Great news. Looking forward to the release. It’ll be right near my birthday, then. Finally, I can play through the game. It’s been hard holding off on this for the last few years.